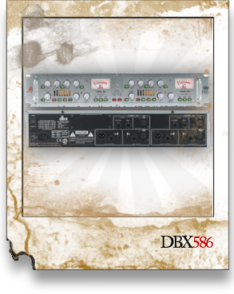 Mic preamps have long been a part of dbx’s reputation as the leader in signal processing technology. In keeping with that proven tradition, dbx proudly enters the vacuum tube domain with the 586 Dual Vacuum Tube Preamp. The 586 is loaded with all the standard features you’d expect to find in a mic preamp including custom designed analog VU meters that monitor tube level, insert path or output levels, +48V Phantom Power, 20dB pad, phase invert, and low cut filter. Line/Instrument and mic inputs make the 586 versatile enough to use with virtually any source device. Add to this comprehensive list of standard features extras like a three band EQ with sweepable mids and selectable mid Q (with EQ hardwire bypass), available insert loop, and the new PeakPlus™limiting topology and you have the latest in a long line of dbx achievements.